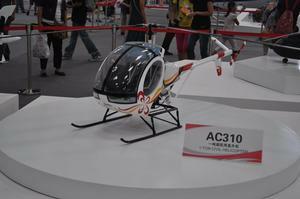 The AC310 is a 1 ton piston helicopter, developed by Avicopter and certificated by CAAC in 2012. Closely resembles the Schweizer 300C. The AC310 has a fully articulated 3-blade rotor and a 2-3 seat cockpit. The maximum payload is 431.5 kg. The helicopter can be equipped with a standard fuel tank of 114 L and/or an Auxiliary tank of 72 L.
Resources related to the AC310 , provided by the Vertical Flight Society. Resources related to the AC310 , provided by public sources across the internet.